Twin-to-twin transfusion syndrome (TTTS) is a complication of monochorionic twin pregnancies in which arteriovenous vascular communications in the shared placenta lead to blood transfer between the fetuses. Selective fetoscopic laser photocoagulation of abnormal blood vessel connections has become the most effective treatment. Preoperative planning is thus an essential prerequisite to increase survival rates for severe TTTS. In this work, we present the very first TTTS fetal surgery planning and simulation framework. The placenta is segmented in both magnetic resonance imaging (MRI) and 3D ultrasound (US) via novel 3D convolutional neural networks. Likewise, the umbilical cord is extracted in MRI using 3D convolutional long short-term memory units. The detection of the placenta vascular tree is carried out through a curvature-based corner detector in MRI, and the Modified Spatial Kernelized Fuzzy C-Means with a Markov random field refinement in 3D US. 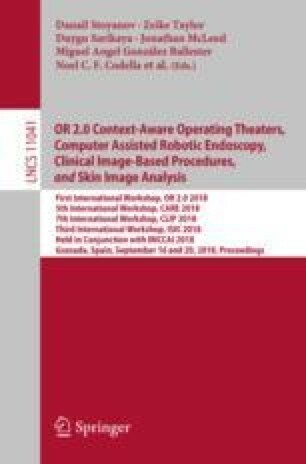 The proposed TTTS planning software integrates all aforementioned algorithms to explore the intrauterine environment by simulating the fetoscope camera, determine the correct entry point, train doctors’ movements ahead of surgery, and consequently, improve the success rate and reduce the operation time. The promising results indicate potential of our TTTS planner and simulator for further assessment on clinical real surgeries. Equally contributing authors: Jordina Torrents-Barrena implemented the novel research algorithms, and Rocío López-Velazco designed and developed the framework. This work was supported by CELLEX Foundation and the Google Women Techmakers scholarship awarded to Jordina Torrents-Barrena. Also this work was funded by the Spanish Ministry of Economy and Competitiveness under the María de Maeztu Units of Excellence Programme [MDM-2015-0502].